Dwarf- flowering gum “Little Sweetie”. These smaller growing flowering gums do however range greatly in size. Some are sold as dwarf varieties that will still reach 6m and more in height. Others are what we regard as more reliable in height and perhaps earn the right to to called dwarf trees. One is Corymibia ficifolia “Dwarf Orange”, and this will get to around 3m in height, and it will take a few years to even get that high. Slow growing yet flowering from an early age it makes an excellent specimen tree for a smaller garden and is one that is suited to growing in containers. We are attracted to a cultivar named “Little Sweetie” (pictured right) and this one will get to around 4m in height. When in flower it attracts both butterflies and bees as well as birds. C.ficifolia “Lollypops” – Will reach around 5m and has dusky pink flowers. C.ficifolia “ Summer Beauty” – Will reach around 6m in height, red flowers. C.ficifolia “ Snowflake” – Wonderful white creamy flowers, will reach around 6m in height. C.ficifolia “ Wild Sunset” – Over time this cultivar will form a nice compact rounded head. Masses of orange to red flowers on tree that will reach around 6m in height. What makes a good dwarf tree is the space between the leaves on each stem, this is referred to as internode length. Short internodes lead to a more compact and bushy growth habit. 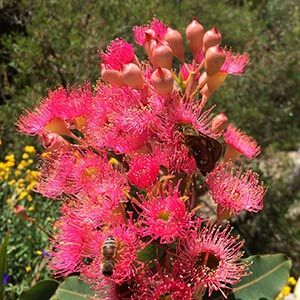 Care of Dwarf Flowering Gums. Most of these plants are grafted and as such you do need to look for shoots from below the graft and remove them with shape secateurs. All require full sun to a a little shade for short periods of the day. Flowering will be restricted in deeper shade. All require good drainage. This does not mean poor dry soils. For best performance the following conditions should be aimed for. Well drained soil, heavy clay soils and soils that are prone to water logging are not suitable. Humus rich soil that will retain some moisture. Plants should be staked when young. This prevents wind rock, and allows the roots to establish themselves. Young plants should receive some extra water through the first summer or two. 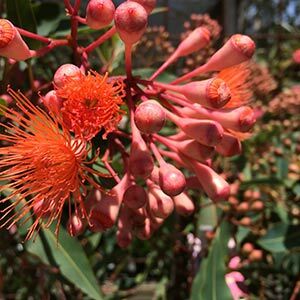 Once established dwarf flowering gums are regarded as drought tolerant. Usually little to no pruning is required. When used near pathways or as street trees lower branches are sometimes pruned away to allow access. Propagation is by grafting. Selected forms are grafted onto hardier rootstock such as Corymbia intermedia.